Left: A colorized image of a sprite (they are red) assembled from a high speed image sequence recorded by my group during an experimental campaign. Sprites are typically 40 km high and comparably wide, and have a top altitude of about 90 km. They are very big. 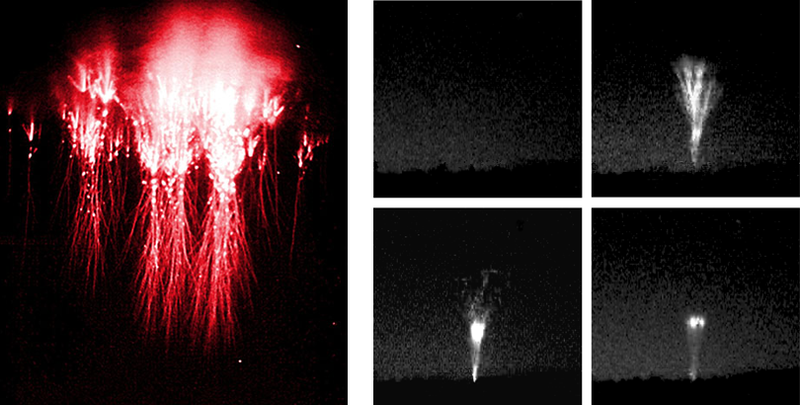 Right: A sequence of 4 regular video frames of a gigantic jet recorded near Duke University. This is basically a lightning channel that shoots out of the top of a cloud and travels to nearly 90 km altitude. Lightning is sometimes powerful enough to create spectacular optical emissions above thunderstorms, generically called transient luminous events or TLEs. Sprites are bright, short-lived flashes which occur above thunderstorms in response to lightning discharges that transfer a lot of electric charge from cloud to ground. They were first scientifically documented in 1989, although they had been anecdotally reported before. Our group’s sprite-related work has focused primarily on measuring modeling the electromagnetic radiation from lightning to help determine why certain lightning discharges create sprites. But we also run a number of regular and high speed cameras aimed at capturing TLEs on video. Maybe even more spectacular are gigantic jets, which were first documented in 2002. We now know these begin as a regular in-cloud lightning leader which, because of unusual electric charge structure in the cloud, is able to propagate out of the top of the cloud. By combining electromagnetic and optical measurements we have been able to discover a number of things about lightning and TLEs. With coordinated electromagnetic measurements our group showed that gigantic jets act like upside-down cloud-to-ground lightning and deposit a lot of electric charge on the ionosphere when they reach their 90 km top altitude. We also showed that sprites carry substantial electric current inside their streamer channels.